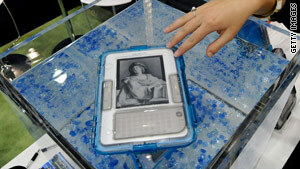 More people are now buying electronic books for the Kindle reader than hardcovers, Amazon says. (CNN) -- Call them the new hardcovers -- without the covers. Buoyed by a surge from two of the world's biggest booksellers and the debut of a "magical" new device from Apple, electronic books have begun staking a serious claim among readers. Online bookseller Amazon said it's now selling significantly more electronic books for its Kindle reader than it does hardcover books, and that the gap keeps growing. CEO Jeff Bezos credited last month's drop in price on the Kindle -- a move that came the same day as a similar drop on rival Barnes & Nobles' Nook -- for at least part of the surge. "We've reached a tipping point with the new price of Kindle: The growth rate of Kindle device unit sales has tripled since we lowered the price from $259 to $189," Bezos said Monday. Over the past three months, Amazon sold 143 Kindle e-books in the United States for every 100 hardcovers, Bezos said. In the last month, the difference was even bigger: 180 Kindle titles for every 100 hardbacks. Sales of e-books still trail far behind those of paperbacks, however. The news comes amid a major rise in electronic book sales spurred, in part, by Nook and Kindle prices dropping and in part by the release of Apple's iPad, which has been promoted in part as an electronic reader. Last week, the American Association of Publishers reported that sales of e-books in May were up nearly 162 percent and that, for the first five months of 2010, e-book sales were up 207 percent over last year. E-books made up about 8.5 percent of all book sales, according to the report, up from less than 3 percent for the same time period last year. So, does the news ring the death knell for those hefty tomes that bibliophiles have clutched for centuries? Not just yet. Overall, adult hardcovers earned about $138 million in May, compared to $29 million for e-books. (It's worth noting that part of that difference is due to hardcover books being significantly more expensive than electronic versions). But experts say that Amazon's shift could be a peek into the future. "This was a day that was going to come, a day that had to come," Mike Shatzkin, CEO of publishing-advice firm Idea Logical Company, told the New York Times. Shatzkin predicted that, in less than a decade, fewer that 25 percent of book sales will be print versions. Bezos called the Amazon announcement "astonishing," particularly considering that the company has been selling print books for 15 years and Kindle electronic books for less than three. Also significant is that the news comes just months after pundits predicted that the iPad could put e-readers like the Kindle and Nook out of business. The iPad went on sale in April and had sold 3 million units by last month. More than 1.5 million books have been bought for the device from Apple's online bookstore. News from Barnes & Noble suggest similar growth patterns. E-book sales increased even as in-store sales remained stagnant, according to the company's earnings report last month. "The explosive growth of digital books has created the most compelling opportunity in Barnes & Noble's history," said Leonard Riggio, chairman of Barnes & Noble, Inc. Some tech observers on Tuesday trumpeted the news as a sign that mobile gadgets must now be taken seriously as an option for mainstream bookworms. Readers "apparently aren't as attached to dead tree books as some e-book critics thought," said writer Jacqui Cheng on technology blog ArsTechnica. "Paperbacks are surely still selling at sky-high rates, but the appeal of having a 'stack' of books crammed into one, slim device is certainly winning over customers."